Yesterday, I posted about my new book, Playing No Limit Hold’em Cash Games at a Casino for the First Time. Today, I logged into Amazon to purchase a friend’s Kindle book. 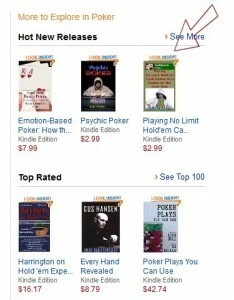 While there, Amazon showed me a link to the Top Rated Kindle books about Poker. I clicked on that to see who was listed, and Bamm! right there on the right hand side, my book was getting some love from Amazon under Hot New Releases section! Gotta love it… Thanks, Amazon! There’s lots of books out there coaching you on no limit hold’em strategy; giving tips on the hands to play, calculating pot odds, how to size your bets, and the like. This book addresses the telltale signs of first-timers and provides tips on how to make your first-time status less obvious to the other players at the table. It’s an exhilarating and anxiety-producing experience for sure, but, you don’t have to get so freaked out that you get busted out before you start to feel comfortable at the table. 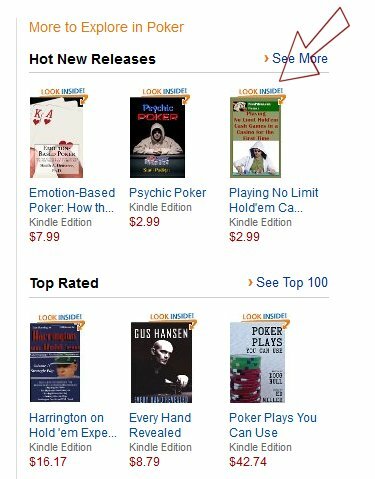 This book is for the novice poker player who is venturing out to play no limit hold’em cash games in a casino for the first time and wants to control “how” freaked out he/she gets. It is loaded with tips that are intended to help the new-to-casino-cash-games poker player look less like a donkey, or a “fish”, as newbies to casino cash play are called. “Donkey” and “fish” are labels assigned to players who play poorly. This book is about how to not look like a donkey when you sit at the table. Whether you end up playing like a donkey is up to you. I’ve witnessed plenty of first-time playing-in-the casino poker players being taken advantage of by more experienced players. I know that if the lack of experience was not so obvious, the newbie would have held on to his/her chips longer. In no limit hold’em, information is power, and when you sit down in the casino for the first time, you don’t want the other players to know how little experience you have playing in the casino environment. Experienced players tend to show more respect to other experienced players. At the casino, you are playing with your hard-earned cash and every other player at the table, no matter how friendly or engaging, wants all the cash at the table. No one came to fold. Presenting yourself as having some level of cash game experience is one way to help you protect your chips so you can stay in the game longer and gain more live play experience. Learn how to register to play cash games, why you should avoid buying the minimum amount of chips, where to place your chips, how much to lead out on a bet, how a casino rewards card can help, about chopping the blinds, straddle bets, tipping the dealers, showing your cards, and more. 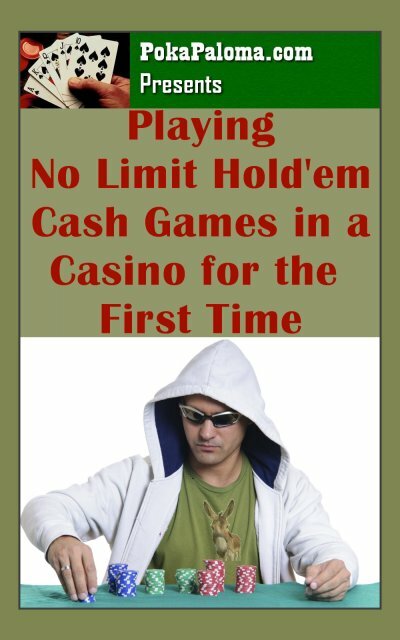 After reading this book you will be better prepared to block everything else out and focus on your game while you face a table of no limit hold’em cash players in a casino for the first time. Read the book, go play no limit holdem cash games for the first time in a casino, and come back hear to tell us about your experience. If you found the book helpful, leave a review on Amazon. If you experienced things that you think should be added to the book, email me. I posted a book review for What Every BODY is Saying by Joe Navarro with Marvin Karlins, Ph. D.
Thanks to @ppapoker for leading me to a CardPlayer article about Phil Hellmuth’s new book, Deal Me In. The article entitled, Deal Me In — Poker Pro Daniel Negreanu: An Exclusive Excerpt from Phil Hellmuth’s New Book, was written by Stephen A. Murphy. I looked at the names of the poker pros who were included in the book, then hopped over to the Poker Brat’s store and purchased a copy. Great reading for my plane ride to Las Vegas in November. I’m looking forward to seeing lucky #13 playing at the WSOP Main Event Final Table:-)! I’ll post a book review when I’m done. Today I added a book review for Mike Caro’s Caro’s Book of Poker Tells. This is an updated version of Caro’s original book entitled Caro’s Book of Tells. 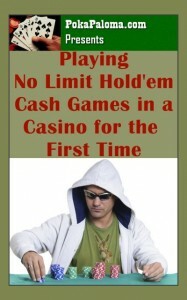 Check out the No Limit Hold’em Book Reviews. Continuing on the theme of recognizing and hiding poker tells and using body language to read your opponents, the next book review will be What Every Body is Saying: An Ex-FBI Agent’s Guide to Speed-Reading People by Joe Navarro. Just posted a book review of Phil Hellmuth Presents Read’Em and Reap by Joe Navarro. The last book I reviewed was Randy Burgess’ Ultimate Guide to Poker Tells. Mr. Burgess’ book was helpful and I enjoyed it. This book by Joe Navarro I enjoyed even more as it contained more of the information that I was looking for, as well as more photos that depicted slight changes in body language. Continuing on the theme of deciphering and hiding poker tells, the next book review will be Caro’s Book of Poker Tells by Mike Caro. 2008, LYLE STUART BOOKS, Kensington Publishing Corp.
by Joe Navarro with Marvin Karlins, Ph. D.